Well it’s that time of year, mid November with short, dark and wet days. I hope you are reading this somewhere warm, perhaps chasing some fish on the flats or just relaxing in the sun. If not, then don’t despair, the weather this weekend looks great, with sun on both Saturday and Sunday and then as we get into next week we are back to heavy rain on Wednesday. So make the most of your weekend and get out in the sun before the rain comes back! Here are some options for you. While a lot of rivers are pretty much done for the season, or at least until winter steelhead show up, there are still some good opportunities out towards the Harrison. For details check out the river fishing reports. If the ocean is more your thing, this weekend is looking good. Nice and sunny and the forecast is for a bit of NW on Saturday but light winds on Sunday. There have been a few fish up Howe Sound as well as the Gulf Islands so check out the saltwater report for more info. If you are taking a break from the water but want to get out of the house, why not attend the SFI Big Splash this coming Thursday or come to our Steelhead Fly Tying Jam Session later in the month. For details check out our events section. It’s also a good time of year to sit back, be thankful for the good fishing we had this year, and of course start planning some trips for next year! 2018 ANNUAL POLICY CONFERENCE – Next Thursday! On November 22nd, the SFI will hold its annual Industry Policy Conference at the Fairmont Hotel Vancouver. This event is a key forum where officials, public servants and those interested and involved in the sport fishing industry can meet, share their perspectives on the issues facing the recreational fishery and, receive updates on preliminary expectations for the forthcoming season. The half day format will begin mid-morning, with lunch and breaks for discussion. The Conference will end just in time for the Big Splash Gala Fundraiser that evening. For more information, or to purchase tickets contact the SFI office at (604) 946-0734 or email at info@sportfishing.bc.ca. You can also purchase your tickets online by going here:2018 SFI Conference and Big Splash. 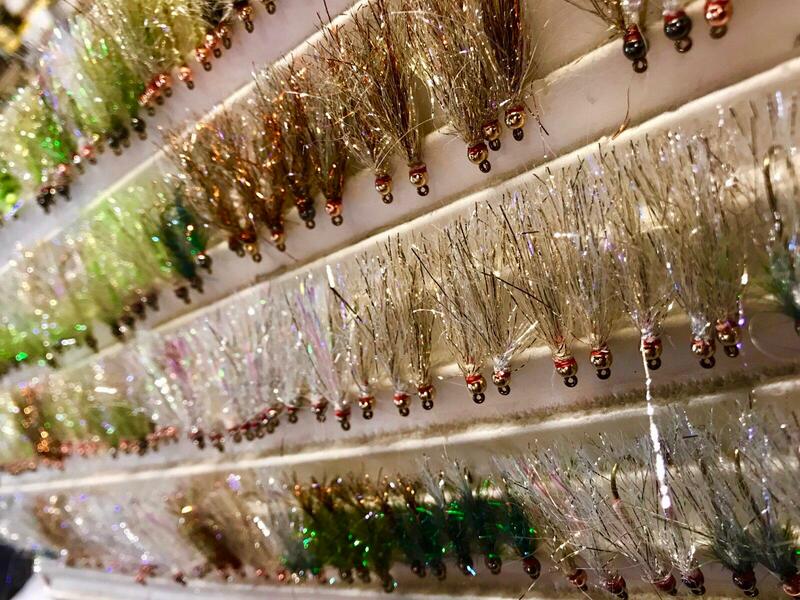 If you missed our special mailout this week for our upcoming annual Steelhead Jam Session – there are still a handful of spots to join us at the tying table for this fun evening! If you haven’t joined us for jam sessions in years past it is a relaxed and fun night for tyers of all levels of experience from beginner to expert to hang out, do some tying, share their favourite flies and techniques, and of course talk about fishing. From intruders to classics, we’ll be tying them all so come ready to share and learn! Read a bit more about the event and our guest tyers here! Reserve your FREE spot here! If you don’t happen to get a spot, put your name on the waitlist (will be available on the same ticket link above) as people’s schedules often change and can’t make it! This year has been a fantastic year for coho fishing and it is starting to come to an end. The Chilliwack/ Vedder system is one of the first systems to receive coho so naturally the action dies off a bit sooner than other systems. Unfortunately, this year hasn’t been a banner year for chum like we have seen the past 2 seasons so there isn’t much to write about in regards to them. Not all is doom and gloom though. There will still be fish throughout but you will have to work to find them. 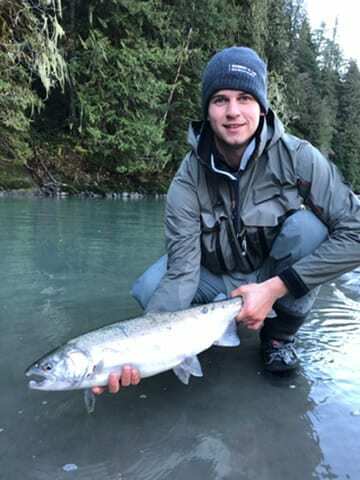 The Chilliwack/ Vedder system is one of the first to see winter steelhead. Traditionally the first steelhead will be caught in the first week or so of December so it is time to start switching gears. Now is the time to take your rods and reels out and give them a good look over. Make sure everything is working properly and in good shape. There’s nothing worse than finding out the night before your first steelhead trip that your line needs to be changed or that your reel is seized. For you pin guys we have a nice assortment of Milner reels in stock as well as a couple Babcock Custom Sage 3113 LB’s. Come on into the shop and get them while you can! We are basically at the end of the line for the salmon season on the Capilano. Everyone gets a little down at this time of year; no more clean fish, no more salmon, etc., and it’s true to an extent. A month ago the pools were full of chrome aggressive fish and now they are mostly filled with spawners. In saying that I can’t say you won’t find any clean fish. There are a few but your window for targeting them is very narrow now. Get out if you want one last crack at them. There is no bait ban on this river at this point in time so sometimes a great way to entice the few chromers that are left is to fish a glob of pro-cured roe through them. If you don’t want to jump on the bait train you can definitely still get them on other stuff like the tried and true colorado blades, single beads, spoons, spinners, and twitching jigs. Fly fishing can be highly effective too as most of the fish will have stacked up by this point and getting a small, sparse, and flashy fly in front of them can work wonders. If you do plan to fish the Capilano please remember to release all steelhead and wild coho with care. This past week saw some fairly decent fishing for salmon and trout, as well as char. Along with its tributaries, anglers were able to find some fresh fish in the main stem using a variety of presentations. This is usually the time when most anglers will start drifting beads under an indicator or float in search of trout and char- but don’t be surprised if a salmon gets tempted as well. 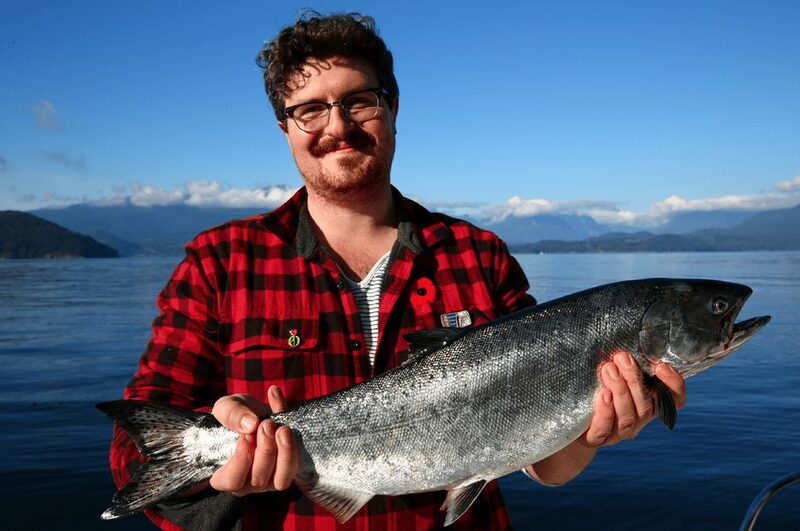 Matthias with a nice fish from his guided trip up to the Squamish this week. Spoons and spinners work well also, so don’t forget to take a variety of sizes and colours as well- especially if the weather changes as water conditions will follow. Wade safe and remember to be aware and respectful of the wildlife. Haven’t got your coho fix yet? Don’t despair there are some late run coho in this neck of the woods. In fact there are fresh coho that come in all the way to December. This fishery is perhaps not for the soft-core as we all know the back end of November is wet, dark, and rainy, but it is those exact conditions that bring in these late run fish. Take your time to explore the nooks and crannies of Harrison and its tributaries and you will often be rewarded with some good fishing this time of year, especially after these recent rains. My preferred method for these fish is stripping in a fly on a 7-weight setup. Line choice will depend on depth and speed of water so you will need a variety of lines or sink tips, but a slow intermediate line or tip is often a good place to start. For flies think smaller, like Andre’s coho flies that we have custom tied for us at the shop. We have some left, but once these ones are gone, that is it for the season, so get them while you can. If you are gear fishing, a medium spin setup can be very effective. Use this setup to twitch jigs or cast and retrieve spinners and spoons. Don’t be afraid to try small spoons like a Gibbs Mini G2. These are tiny and you won’t be able to cast them on their own so used some split shot about 24 inches up the line. Colour choice will depend on sunlight and water clarity. Think copper and brass in clear water and sunny days and go to brighter finishes live silver or painted finishes in dirty water and dark days. Remember to check the regulations in the area you are fishing and carefully release all wild coho. Some productive patterns for the Harrison Area. Salmon fishing on the Stave is almost over. There are some chum left but most are spawning now and will not be fun to catch. You can float fish with jigs to target the clean ones, just adjust your depth and cast past the older fish into the deeper slots, as that is where the fresher fish will be traveling. Coho fishing is still possible however most are starting to colour up now. I went there on the weekend and noticed there were a lot less fish than before. Please respect other people’s spots when fishing this river. It is a more popular river in the Lower Mainland so treat others and their space with respect and everyone will be happy. We had some guided trips this past week and I did some personal fishing as well and we can confirm there are fish spread throughout Howe Sound as well as some fish over at Galliano and Gabriola. This past week the fishing was actually pretty tough, it was definitely better a little earlier in the month, but that is classic winter chinook fishing. Here one day and gone the next. I don’t wait for reports, I just look at the weather and go, and I make the report and I recommend you do the same. You can have one of your best days of the season one day and get skunked the next, that’s how fast these fish move around. It’s also what makes it so intriguing, you just never know what you are going to get and every day is a fresh challenge! If you fish hard you are going to get your chances and put some fish in the box and that is exactly what happened on our trips this past week. A nice hatchery chinook from a trip with Captain Lars this past week. The weather looks pretty good this weekend, perhaps a bit of outflow in Howe Sound, but nothing major. Most importantly it is going to be sunny! So this would be a good weekend to book a trip or get out on your own boat. Hot flashers this past week were green (STS) and chartreuse (BC) glow with Irish Cream and Homeland spoons in 3.0 and 3.5. Skinny G were also working well in the same colour patterns.